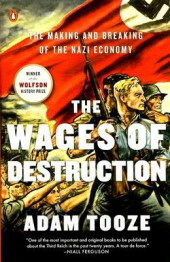 Adam Tooze’s mammoth dissection of Nazi Germany’s economy, The Wages of Destruction, is not for the faint of heart. It is a thick volume, heavily annotated, and studded with graphs at regular intervals. Fortunately, those willing to take the plunge will be rewarded with a fresh, compelling take on the roots and conduct of the Second WorldWar in Europe. Tooze charts the German economy from the end of the First World War to the final days of the Second, when Germany was reduced to little more than smoking ruins. His research is organized around the thesis that Adolf Hitler foresaw the rise of the United States and Soviet Union as superpowers, as well as the simultaneous decline of the two major colonial powers, France and the United Kingdom. Hitler, he argues, was convinced American and Soviet potential lay in the size of their respective economies: physical resources, labor forces and consumer markets Germany could never hope to equal. Hence the need for an expansionary war of conquest – one Hitler’s racial ideology and fervent anti-Bolshevism oriented toward eastern Europe. would soon be eclipsed by those of the two emerging superpowers, particularly the United States. Unfortunately for the Nazis (and all the better for the rest of us), their strained, debt-laden economy wasnever in any kind of shape to wage a world war. Tooze also takes careful aim at the reputation of Hitler’s technocratic Armaments Minister, Albert Speer, concluding that much of the economic “miracle” historians usually attribute to Speer was in fact made possible by earlier efforts at rationalizing production. central thesis, or that it would simply push the book well beyond a reasonable length is not entirely clear. Nonetheless, it comes off as a glaring deficiency.